Summary AC3000 class three-radio Wi-Fi range extender with 4 Gigabit Ethernet ports and USB 2.0 port supporting storage sharing. When NETGEAR announced its EX8000 Nighthawk X6S Tri-Band WiFi Range Extender at the end of August, I dubbed it the "DIY Orbi Extender. Little did I know how accurate that description was for reasons I'll reveal shortly. The EX8000 is the first three-radio/"tri-band" Wi-Fi extender to hit the market. Like the original RBK50 Orbi, the EX8000 combines a two-stream dual-band 802.11ac AC1300 class radio with a third, four-stream 5 GHz radio. Also like Orbi, the two-stream 5 GHz radio only operates in the 5 GHz low-band channels (36-48) and the four-stream only in the high-band channels (149-161). But unlike Orbi, any of the three radios can be used to link back to the wireless router you're extending. Orbi always uses its 5 GHz high-band radio for backhaul, falling back to sharing the 2.4 GHz client-facing radio also for backhaul in the unlikely event it can't get a 5 GHz link. However, the biggest difference between Orbi and the EX8000 is that Orbi will link only to other Orbis, while the EX8000 will connect to any router. Since the EX8000 also can be set to function as "tri-band" access point, you can even use a pair of them as a wireless bridge. A pair of EX8000's won't replace an Orbi, however, since it has no routing features. The LED callouts show Link Status and "Maximum Throughput" indicators meant to communicate backhaul condition. It doesn't look like the two lights can tell you which 5 GHz radio is being used for backhaul. Of course, since that depends on the 5 GHz channel you set your main router to, you'd already know that. The EX8000 is meant to sit on a shelf or table; it has no wall/ceiling mount screw slots. NETGEAR requested short-term confidentiality on the EX8000's FCC internal photos, so I opened it up after testing was completed. I didn't have to go very far with disassembly because the innards looked very familiar. If you compare the EX8000 photo above with the RBK50 Orbi photo below, it's obvious the two use the same main board. The differences I could detect are highlighted in the photo; 32 MB of flash replacing the 4 GB in Orbi and no Bluetooth radio. The top of the two products is also different, with different plastic brackets supporting the antennas and light-guides for the EX8000's onboard LEDs. The table shows the key components of both. The last test placed the R7800 in my downstairs office and the EX8000 in the upstairs living room. This setup is basically the same used in my original over-the-air mesh test process. Like the mesh process, I used the same kitchen location, one floor up and at the opposite end of my home; my worst-case scenario. I should note the EX8000's living room location earned an unprompted query from Ms. SmallNetBuilder, as in "What's the black box in the living room?". When I explained that it did the same thing as the white box (Orbi) and asked if she liked it, the reply was a quick and emphatic "No!". I get that NETGEAR is trying to address a different market with the EX8000 and wants to protect the Orbi brand. But I think they should have gone with the higher WAF design. Just sayin'. I used a Dell XPS13 running Windows 10 Home 64 bit with a Dell Wireless 1820A Wi-Fi adapter as the test client. This is a 2x2 802.11ac adapter using a Broadcom BCM4350 client device. iperf3 was used to run traffic between a Windows 7 machine running iperf3 server connected to an R7800 LAN port and the XPS13. The EX8000 was set up with different extender SSIDs so I could associate the Dell where I wanted. The 2.4 GHz downlink plot shows the EX8000 improves a 2.4 GHz client connection in the kitchen from basically unusable to about the same as you'd get with the client parked right next to the R7800. Actually with the 2x2 5 GHz low-band radio (Ch 40)used for backhaul, throughput in the kitchen actually came out better than you'd get next to the router. 2.4 GHz uplink results show similar throughput improvement vs. direct connection to the R7800 (Remote No Ext). The 5 GHz client in the kitchen was unable to even see the R7800's SSID, so there is no Remote No Ext value to compare. Even though downlink throughput via the EX8000 is lower than baseline, connecting the XPS13 to the EX8000 yields about 150 Mbps throughput where there would otherwise be none. There was little difference between using Channel 40 or 149 for backhaul. For 5 GHz uplink, throughput using Channel 40 for backhaul is significantly higher than using Channel 149. In this case, since the 4x4 radio is used for client connection, it appears the extra streams improve the connection for the two-stream client. I'm sorry I haven't anything to compare the EX8000's performance with, since I've given away previous extenders tested and used a new test process. But I think it's clear the EX8000's 5 GHz radios can provide a high bandwidth extended connection over a surprisingly wide signal range. Given this is the same radio used in Orbi, we already knew that. But it's good to see the benefits of Orbi's excellent 4x4 5 GHz radio are now available to everyone. 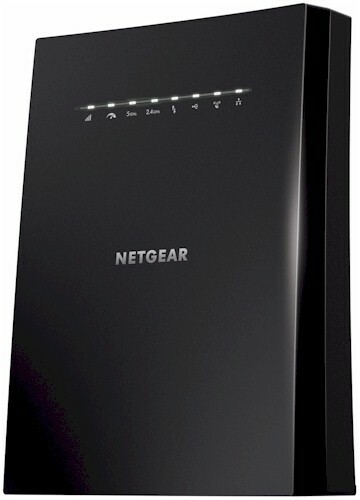 Yes, $230 is a lot to pay for a Wi-Fi extender and it's almost twice as much as NETGEAR's previous top-of-line EX7000, which I haven't reviewed. But the price might come down over time, especially if Linksys prices its similarly-designed, yet-to-be-released RE9000 more aggressively when it hits stores. Since the Linksys is based on Mediatek, not Qualcomm, silicon, Linksys should have the margin to do it. In the meantime, if you like the router you have and just need to cover a pesky dead spot, the EX8000 can probably do the job better than anything else you can buy.